What to the Asian queensin Asian Soil is the question Damaru Golf in aced with So are for the millions of fans across Asia. "I didn't watch the last four feet of it," she said.TO DamarU GolF (DG) in the air at bagging what was her first tournament since her 2010 US Open victory and the 10th LPGA win of her career. She leapt in the air spontaneously, . Later she called -The first was to her parents and the second to her fiancee, Derek. "I'm not married yet so mum and dad got the first call. Dad would have been upset if I'd called him second." The play-off was as unlikely as it was thrilling for, when Webb mounted the 10th tee, she was three ahead and seemingly set to enjoy a wire-to-wire win hard on top of her Australian Open success. 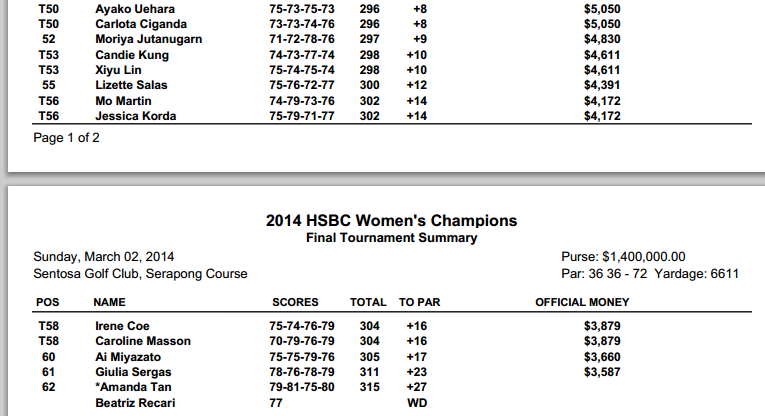 Everything had gone as planned over the first half when she was out in 35 and 12 under par to Creamer's nine under. A dropped shot at the 13th was neither here nor there, but she made a bad swing off the 15th tee on her way to another bogey and was more than somewhat thrown when she was put on the clock at the 17th. She still salvaged a par but went on to make a hash of the 18th after driving into the bunker. 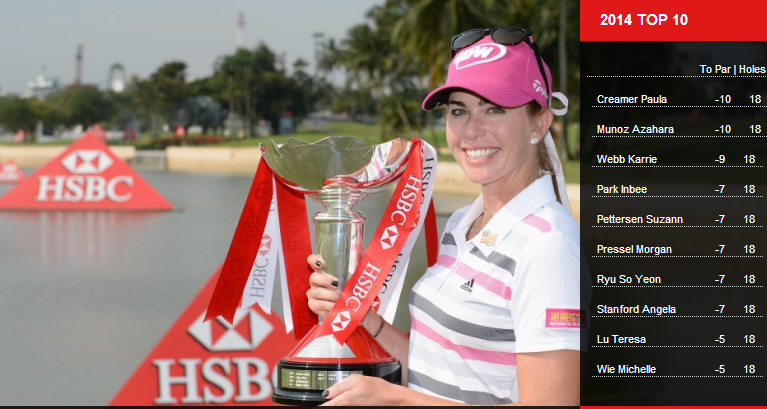 2 March 2014, Singapore – Paula Creamer sank the putt of her life to claim victory in the HSBC Women’s Champions following a two-hole play-off with Spaniard Azahara Munoz at the Sentosa Golf Club this afternoon. Once again the tournament, dubbed Asia’s Major, went down to the wire, with the 27 year old American picking up a vital birdie on the 15th hole to secure her place in the play-off, ending the day with a 3-under par 69, taking her to 10-under par for the tournament. Munoz birdied the 17th, taking her to 10-under par and a share of a three-way lead with Karrie Webb, only for the Australian to bogey the 18th. It was a bitter blow for the Hall of Famer who had shown such consistent form all week. The play-off saw both golfers par the 18th in the first re-run before heading back down the fairway to tee off for a third time in the same afternoon. But this time Creamer made the green in two, before watching a 75 foot putt drop into the hole for an eagle, sending her and the thousands of supporters assembled around the green into a frenzy of excitement. Always a favourite with the fans in Singapore, Creamer is a popular and highly deserving champion. Speaking after the trophy presentation, Creamer, who receives a winner’s cheque of US$ 210,000, said, “I'm shaking. Oh, my gosh, this has been such a long time coming and I wouldn't be here today if it wasn't for Colin, my caddie, my best friend, he's been there through it all. Azahara Munoz, gracious in defeat, commented, “Today I started bogey, bogey so that got me really behind and then I made a couple really nice birdies and gave myself a lot of chances. Didn't quite make enough putts today but made some really nice ones on the back nine for par and that kept me going and at the end made a couple [of] really nice birdies. “It was exciting. For starters I didn't think I was going to give myself the chance to be in the playoff, so just being there, I was really happy to be in contention again, and you know, it's always fun. But that putt, it's pretty much impossible to putt it and to hold it, so nothing you can do about it, just congratulate her,” added Munoz. 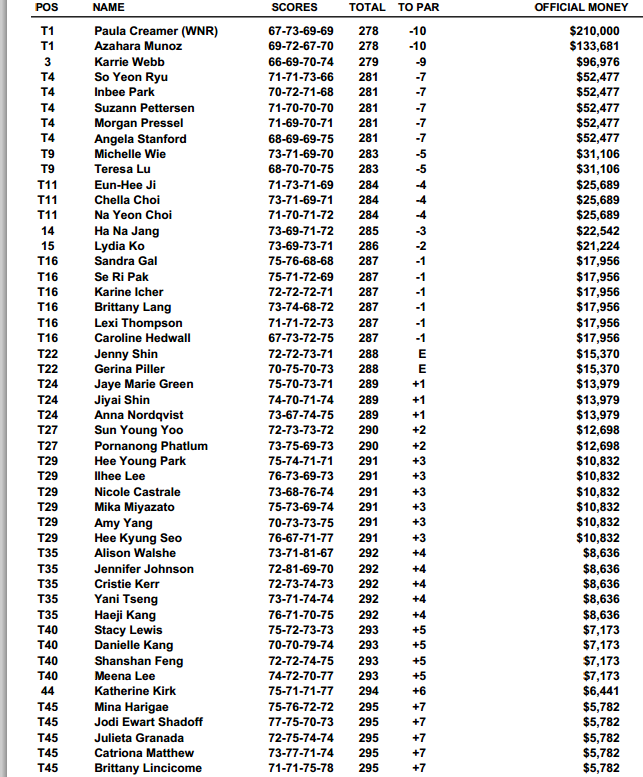 Meanwhile leader for the first three rounds, veteran Karrie Webb suffered a disappointing day on The Serapong. Scoring a bogey on par-four 3rd, and only two birdies on the front nine, it was on the back nine that the World No. 7 relinquished her chances for the title. After hitting a bogey on hole 13, Webb went into the water at 15, a similar fate to that suffered by Stacy Lewis on her way to the title in 2013. Unlike Lewis, Webb was unable to recover, and a trip into the fairway bunker on the 18th saw her finish in third place on 9-under par. A disconsolate Webb said, “Two weeks ago I handled the pressure well and made very good decisions coming down the stretch and I made all the putts I needed to make. It sometimes just doesn’t go your way. Doesn't feel great at the moment. There's lessons to be learned from the decisions made. “With the wind into us on 18, I just should never have hit driver off that tee. I had said to Mickey, if I can't reach a 5‑wood, there's no point in going, and I don't think I could have hit it far enough down there in that situation. I should have just laid up off the tee and given myself a wedge in, but I didn't do that and so not a lot of good decisions,” added the Queenslander. Giles Morgan, Global Head of Sponsorship and Events at HSBC said, “HSBC Women’s Champions is one of the toughest tournaments in world golf and in this, its 7th edition in Singapore, it’s once again lived up to its billing as ‘Asia’s major’. Thousands have enjoyed our flagship women’s event and the superb performances of one of the strongest fields ever assembled in Asia. Our congratulations go to Paula Creamer on winning in such fantastic style. The Serapong is a true test of golf and she is very deserving of the title ‘Champion of Champions’ after battling against the best players in the world all week. Guy Harvey-Samuel, Group General Manager & Chief Executive Officer, HSBC Singapore added, “For HSBC, the players and the local community it’s been a memorable week as we continue to showcase the best of women’s golf in Singapore. This championship is an important event that lets us connect with our customers and fans through a very special experience that only golf can offer. Testament to its ongoing success, is the number of fans who have turned out – I hope they have enjoyed it as much as we have in hosting. “I would like to extend my sincere thanks to everybody that has made the seventh edition of the tournament our best yet, including HSBC’s business partners who have joined us over the course of the week, the players and officials from the LPGA Tour, event organisers IMG and of course all the fans that have made their way to Sentosa over the last four days. Our congratulations go to Paula and we look forward to returning in 2015,” added Harvey-Samuel. Guy Kinnings, Global Head of Golf, IMG said, "We've enjoyed an excellent week here at Sentosa watching some of the biggest names in world golf competing for a title the players consider to be Asia's Major. Once again the HSBC Women's Champions has enjoyed a thrilling finish and the spectators have enjoyed a fantastic week of golf. As the curtain falls on yet another showpiece tournament, the HSBC Women’s Champions has a new champion and another compelling chapter in its history. 2 March 2014, Singapore – Golf fans and visiting families enjoyed a world-class display of golf during this year’s HSBC Women’s Champions, with scores of fans making their way to Sentosa for the tournament dubbed Asia’s Major. Yet again, the tournament went down to the wire on day four with an exhilarating 2-hole play-off between Spain’s Azahara Munoz and the USA’s Paula Creamer. The American secured the 2014 title after sinking a killer putt, sending the crowd into a frenzy at the 18th hole. But it wasn’t just the on-course play that offered crowd entertainment as hundreds of spectators were seen testing their own golf skills at the HSBC Women’s Champions Interactive Village, which included the HSBC Ultimate Bunker Challenge, HSBC Coaching Nets, a Golf Simulator and a Putting Challenge. The Interactive Village was also a chance for spectators to refresh themselves and learn more about tournament co-sponsors including Jaguar, Official Automobile, andairweave, Official Premium Mattress Topper for the 2014 HSBC Women’s Champions.